1930 Chrysler Model 77, Antique Clocks, antique metal-working machinery, and things I am too old to do. I can't resist. Lucky you, it's just your 1928 Chrysler rear end that needs repairs. I just found out my 1932 rear end will undergo repairs next Thursday. Final question for this subject: Since my Carter Carb is too small, is not even remotely original to my car, and should be replaced, what available and affordable carburetor should I be looking for for my 268 CID engine? I am not trying to make my car totally authentic even though I don't want to do anything that would not be reversible to some future restorer. I want it to be a reliable driver when I feel like taking it out for the fun of it, or to shows, or I and or my grandchildren sometimes feel like just showing off. I expect "The Caponemobile" to be a low mileage, low use car. Should we, as a practical matter, just do with what we have? Many thanks for your reply, and the nicely detailed photos. I am left with this question. Your photos seem to suggest new pins, the long threaded rods in the lower right photo, have threaded heads so that the "pins" can be inserted into the retainers riveted to the catwalk by threading them into the retainers. That leaves two questions. can the original "pins" be removed without cutting the retainer rivets? If so, how. My second question, how do you hold the threaded heads to tighten them in place? I guess my real question is, "What am I missing?" I am obliged for any help you can provide. Tim, what is the difference between the wheel base of a 70 four door and a two door sedan, if any? 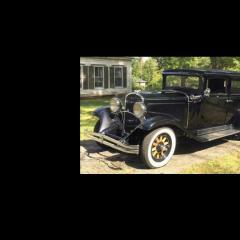 (My 1930 "77" four door sedan has a 124" wheel base.) 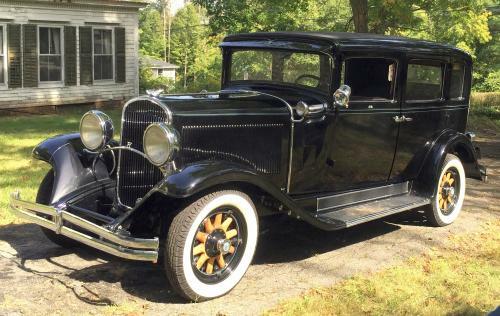 It is interesting that the sedan and the coup in your pictures have the same vents on the sides of the hood as those used on some 77 cars of 1930. There are certainly more important questions I should be asking, and I will discover them when spring weather lets me resurrect my 77 four door sedan. I can hardly wait! In the mean time, I have the original winged radiator cap on my car, and wherever I park it I feel compelled to remove the cap. That is easily done, as assuredly others with sticky fingers are aware. I don't want to lose it thus my two questions. Is there a plain substitute for the winged cap available that I can put on the car between car shows? If not, what have others done to prevent theft of the cap? I have thought of making a chain arrangement with a bar dropped through the opening on the radiator so long that it would require some careful manipulation to extract the assembly. There are probably better ideas out there, but right now they evade me. I would appreciate any suggestions except "Leave the car in the barn." Kaiser, thanks for your reply. I think the panel is intended as a kick panel. It consists of the same material as the running board, framed by a chrome plated half-round molding. It seems like a good idea. I am surprised it was not copied and used by other models or manufacturers.